It’s that time of the year again: allergy season. For many, it means red, itchy, watery eyes (“allergic conjunctivitis”) and a runny nose (“allergic rhinitis”). Seasonal allergies occur as pollen counts rise and seasonal grasses come in to bloom. The chemical that causes these symptoms to occur is histamine, which is released from special cells in our blood and tissues known as mast cells and basophils. There are three main types of medications used to treat allergy eyes. These are drugs which act to block the action of histamine. They are available in eyedrops that are sold without prescription, or “over the counter (OTC)” Pheniramine maleate 0.3 percent is most commonly used and is found in brand name products Opcon A, Naphcon A, and Visine A. 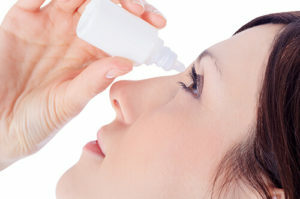 These same brand products include Naphazoline, which constricts the blood vessels on the eye, or “takes the red out.” The over-the-counter products are typically taken as one drop, four times a day.Antihistamines are also available orally. Weaker oral medications are found in the brand names Claritin and Zyrtec. A more potent medication, Diphenhydramine, is found in the Benadryl brand. In the emergency room, we can give Benadryl intravenously for severe allergic reactions. Bendadryl can make you sleepy, and it is the most common ingredient in OTC sleep aids. It is therefore best taken at night. The drug, Olopatadine, is sold as a prescription eyedrop, Pataday. This medication works to avoid having the mast cell release the histamine. In essence, it is trying to lock the barn before the horse gets out. Mast cell stabilizers can take a week or so before they reach their maximum effectiveness. Corticosteroids are drugs which mimic the effect of hormones naturally produced in our body. “Steroids” suppress inflammation and our immune response. All steroid eye drops are dispensed by prescription only. Some drugs are weaker steroids such as lotoprednol, (brand name Lotemax), and Fluromethalone (brand name FML). Others are more potent such as prednisolone acetate (brand name Pred Forte).There are two main side effects from topical steroid eyedrops that can be harmful to our eyes. In some patients steroids raise their eye pressure, which can damage the optic nerve. This condition is known as glaucoma. Steroids can also cause cataracts. Therefore, it is very important that anyone using topical steroid eyedrops are monitored carefully by an eye doctor. Sometimes we will use steroids in combination with a mast cell stabilizer, and then gradually withdraw the steroids. An ophthalmologist, as the only licensed eye medical doctor (M.D. ), will work together with his/her colleagues in medicine on a systemic approach to allergies. As an example, this year we had a 9-year-old boy from Australia who spent most of the winter with us. He had a severe form of allergic eye disease that actually caused changes in his cornea and reduced vision, which affected his ski racing. He has been under the care of corneal specialist ophthalmologists in Australia but still had significant problems. Together with Robert McDermott, M.D., allergist and immunologist, we were able to diagnose and treat his allergies systemically, and treat his eye directly. His vision returned to normal, and his family has since flown back to Colorado for follow-up eye care. Dr. Matthew Ehrlich is the Vail Valley’s only full time ophthalmologist and founder of the Eye Center of the Rockies. He can be reached at his offices in Eagle 970-926-7773, or in Glenwood Springs at 970-928-0105. Visit www.EyeCenterRockies.com.